Not today, Zurg! On a mission to save the Galaxy, Buzz Lightyear travels to distant planets in his Star Command Spaceship. Buzz is always ready to take on his arch enemy, the Evil Emperor Zurg. If his spaceship gets damaged, Buzz has a secret moon buggy to take out onto the surface! 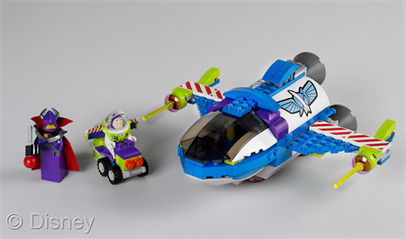 Help build your nephew and niece's anticipation for Toy Story 3 with this LEGO Toy Story Buzz Star Command Ship.